French philosopher Henri Bergson drew distinctions between different kinds of knowledge — science v. philosophy, perception v. intuition — and wrote extensively on the moral implications of freedom and the relation between body and mind. He embraced Charles Darwin's theory of evolution, adding his own caveat that the driving force of natural selection could not be merely the blind luck of survival but some creative force driven by the original impetus of life. He won the Nobel Prize for Literature in 1927, and died in 1941. 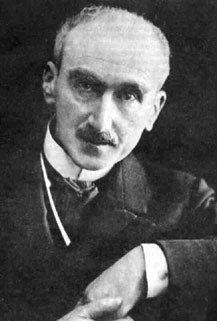 His father, Michał Bergson, was a composer and pianist of some regional renown. His sister Mina was known as Moina Mathers after she married occultist and magician Samuel Liddell MacGregor Mathers, mystic mentor of Aleister Crowley. Bergson's wife, Louise Neuburger, was a cousin of novelist Marcel Proust.